Are you ready to trade your current location for a discount? If you are, there are plenty of retailers looking to take you up on the trade with coupons, special deals and more. Services like Foursquare, Loopt and Gowalla are in an arms race to sign up users, and in partnership with advertisers, are giving away coupons and savings to individuals who check in to their favorite stores. To take advantage of these offers, sign up for one of the services and download the app to your mobile phone. After you have it installed and are logged in, you simply tap on "check in" the next time you visit Sports Authority, Starbucks, Best Buy, Apple and other retailers large and small to unlock discounts. Location-based discounts work in different ways, but like a loyalty card, you get points when you visit a place of business. With Foursquare, if you are the most frequent visitor then you are made "mayor" of the establishment. Becoming the mayor could take two trips or 20; it just depends on who has visited before you. Some offers, like the coupon from Sports Authority, require you to be mayor to get the discount, while others, like the Eye-Fi giveaway on Gowalla and Loopt coupons, only require a small number of visits. $10 off at Sports Authority: The biggest discount we've seen to date for a Fourquare mayor comes from Sports Authority, which is giving a $10 off any purchase coupon code to the mayor of each of 463 Sports Authority stores. What's great about deals like this is that if you steal check in and steal the mayorship away from someone else you can use the discount too. 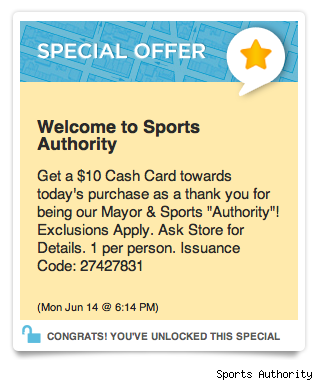 The $10 Sports Authority Foursquare special offer to mayors will run through August 6. Unlike the Starbucks offer, employees are not eligible for the discount, so you shouldn't have to fight the workers to be the mayor. "Sports Authority is continually looking for new opportunities to engage with our consumers where they are choosing to engage with us, and Foursquare is one of those opportunities." said Clay Cowan, VP of E-Commerce for Sports Authority, in an email to WalletPop. Adding, "It is too early to tell what type of business implications Foursquare has for us, but we look forward to seeing what unfolds with our current pilot program there and elsewhere." Eye-Fi cards and HotSpot Access:Eye-Fi, makers of an incredibly cool WiFi-enabled SD card that automatically uploads your pictures to the Internet or your computer, has teamed up with Gowalla to give away 500 Eye-Fi SD cards to visitors of BestBuy or official Apple stores. When a Gowalla user is in the store, he or she can check in and automatically find out if they are a winner of the Eye-Fi card valued at $75. Even if you don't win, checking in will unlock a code for a year's worth of access to more than 21,000 Eye-Fi hotspots, including Starbucks. $1 Off at Starbucks: Speaking of Starbucks, the company is still offering Starbucks mayors $1 off of a frappuccino through June 28. Unlike many other offers, it's estimated that you'll need to check into Starbucks 30 times to become mayor, which is a lot of checking in for only $1 off. 25% off at Gap and more: Loopt's new Looptstar iPhone app allows users to check in for rewards from many retailers and earn rewards after a reasonable number of visits. Gap is offering Loopt users who check in to a Gap store twice a 25% off coupon. Additionally, Burger King is giving away a free coffee or soda with a burger purchase after three check ins and Universal is handing out five free songs to users who check in at a bar. Checking in on a location-based service is quickly becoming the new loyalty card. My only complaint is that with three services offering discounts at different retailers, I'm still stuck with three apps and multiple check-ins even if I can leave my keychain full of loyalty cards at home. Hopefully an app will arrive that lets you check into all location-based services at once and receive all of the discounts and coupons.